January is Cervical Cancer Awareness month and we are sharing information on how to prevent cervical cancer. Cervical cancer is the easiest female cancer to prevent with regular screening tests and follow-up appointments. Cervical cancer most often occurs in women over the age of 30. Since cervical cancer may not show signs or symptoms in the early stages it is important to get screened. It is recommended that women should have regular screening tests to help prevent cervical cancer as early as 21 years old. 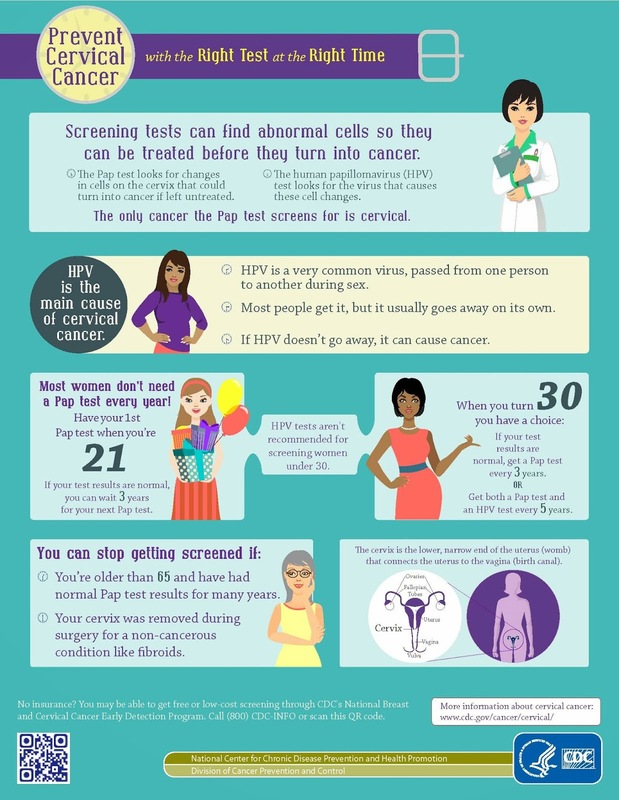 Since there are various recommendations for when a woman should be screened for cervical cancer, we have included an infographic below for clarity. There are two tests that help prevent cervical cancer, the Pap (or Pap smear) test and the Human Papillomavirus (HPV) test. The Pap test looks for precancerous cells and cell changes on the cervix that could develop into cervical cancer if they are left untreated. The HPV test looks for the HPV virus that causes cells to change which can eventually develop into cancer cells. HPV is the main cause of cervical cancer. Just a friendly reminder to you, the HPV test and the Pap test do not test for ovarian, uterine, vaginal, or vulvar cancers. Should you have any unusual signs or symptoms go to your doctor to find the cause. If you do not have health insurance, you might be able to get a free or low cost Pap test through the National Breast Cancer and Cervical Cancer Early Detection Program. For more information and to learn more go to www.cdc.gov/cancer/nbccedp.